A report by Bill Chappell for NPR. Cuba’s state telephone company will allow mobile phone customers to use the Internet via a new 3G network, starting on Thursday. But as with previous tech advances in the island nation, only those who can afford it will be able to take advantage of the access — which remains under the control of the autocratic government. 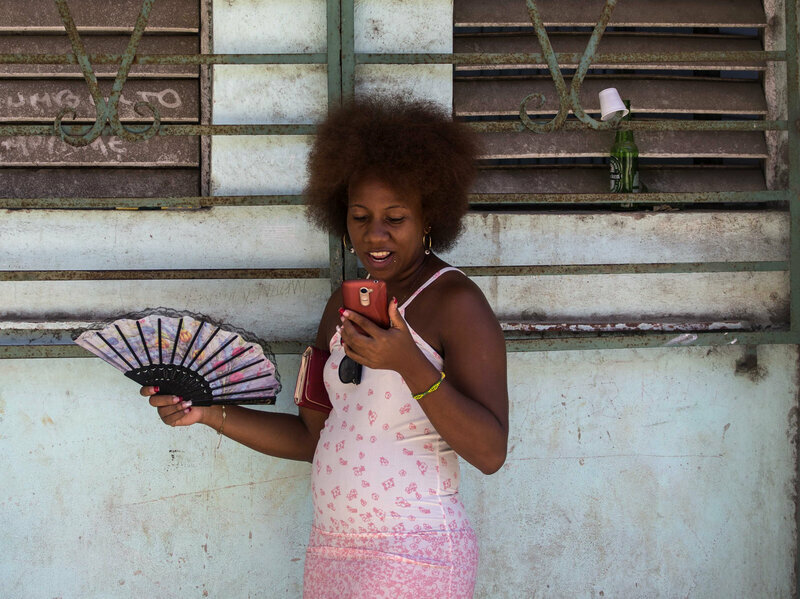 Phones have emerged as a key method of accessing the Internet in Cuba. After all, it was only 10 years ago that the Castro government lifted its ban that prohibited regular citizens from buying computers, and Internet access in private homes was rare before 2016. Cubans also “continue to face extremely slow connections of 1 Mbps, even at Wi-Fi hotspots,” according to Freedom House’s report on Cuba’s Internet access that was released last month. To take advantage of the new service, Cubans will need to pay the equivalent of $7 for 600 megabytes of data, $10 for 1 gigabyte and $30 for 4 gigabytes, according to the state-run Granma news agency. The cost of access poses a steep barrier in a country where nearly 60 percent of the population lives on $100 or less per month, as a 2016 Cuban consumer survey found. Despite that obstacle, 68 percent of Cubans said they had a Facebook account, and 57 percent said they had an email address, the survey said. The promise of wide mobile access to the Internet comes more than a year after Google helped boost Internet speeds within Cuba, installing servers through a deal with ETECSA. The country’s main Internet link comes through the ALBA-1 submarine cable, which runs from Venezuela. ETECSA also routes some traffic through a private satellite. In recent years, Cubans have been able to access Facebook and other popular Internet sites via their mobile phones — but it often involved a combination of a special access card sold by ETECSA, pay-as-you-go public Wi-Fi hot spots and phones that were sent from relatives abroad. In 2015, President Obama allowed U.S. businesses to invest in Cuba’s telecom sector. Shortly after that move, the Communist government opened hot spots to the public; previously only tourists and government officials could use the Internet, as NPR’s Carrie Kahn reported. The new service will be available on Thursday, and this week the first mobile customers will receive notifications that they’re eligible. Because of the size of the service rollout, Cuba’s telecom company will send those notifications over the course of three days. Cuban President Miguel Díaz-Canel celebrated the wider access, saying via Twitterthat it was an advance for Cuban society. The government also broadcast a roundtable discussion on national TV Tuesday night, featuring ETECSA President Mayra Arevich and Cuba’s communications minister, Jorge Luis Perdomo Di-Lella. And in a sign of how things have changed in Cuba in recent years, their discussion also was streamed on Facebook and YouTube. But there were also signs that Cuba will need to keep working on its infrastructure to improve notoriously spotty and slow service. As it told its customers about the new Internet access, ETECSA also warned them that in the first days of operation, “incidents could be experienced” that will disrupt service.